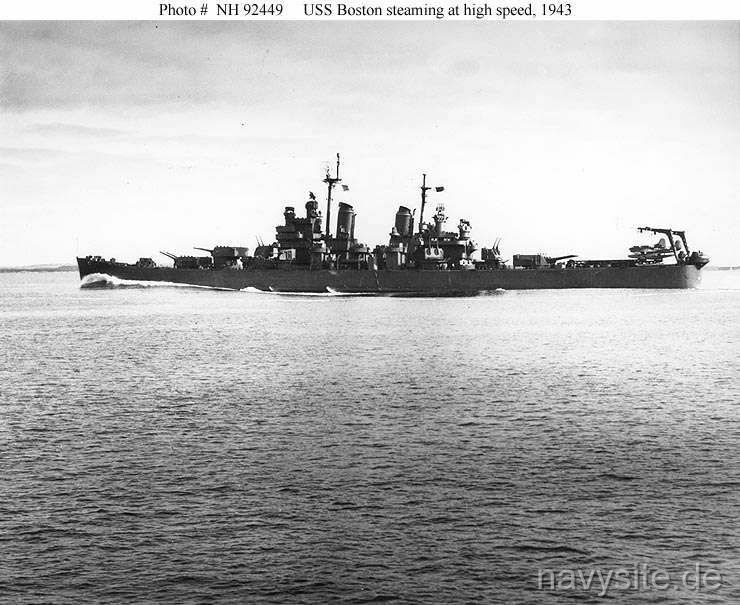 Initially commissioned as a BALTIMORE - class heavy gun cruiser, the USS BOSTON was the sixth ship in the Navy to bear the name. During World War II, the ship operated in the Pacific. Following the Japanese surrender, the BOSTON remained in the Far East on occupation duty until February 28, 1946. She then returned to the United States and was placed out of commission in reserve at Puget Sound Naval Shipyard March 12, 1946. BOSTON was reclassified CAG 1, January 4, 1952. 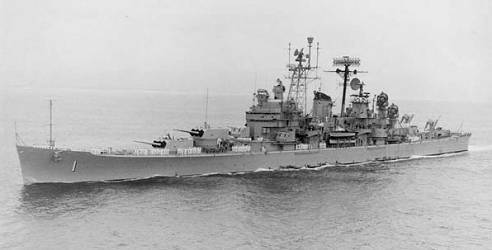 In February 1952 she was towed from Bremerton, Wash., to Philadelphia for conversion to a guided missile heavy cruiser by New York Shipbuilding Corp., Camden, N.J. During conversion her after-8" turret was replaced with anti-aircraft missile launchers and she was otherwise modernized. BOSTON was recommissioned on November 1, 1955. For the next 15 years, the BOSTON operated from the US east coast, conducting several Mediterranean deployments. This schedule was only interrupted by three tours of duty off Vietnam between 1964 and 1970. On May 1, 1968, the BOSTON was again reclassified CA 69 and her Mk-10 Terrier missile system was retired. Finally decommissioned on May 5, 1970, the BOSTON was sold for scrapping on March 1, 1975. This section contains the names of sailors who served aboard USS BOSTON. It is no official listing but contains the names of sailors who submitted their information. 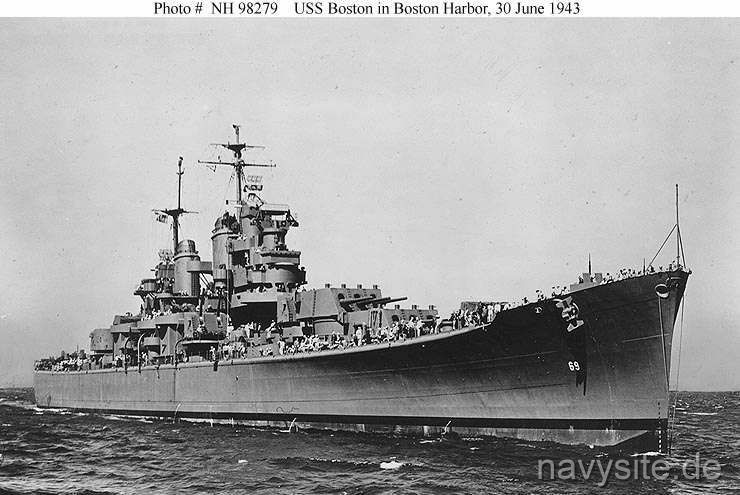 Click here to see which USS BOSTON memorabilia are currently for sale on ebay. June 16, 1968 off Vietnam US Air Force F-4 jets sink a US patrol boat and attack the USS BOSTON and the Australian destroyer HOBART near the demilitarized zone off Vietnam after mistaking the ships for low-flying enemy helicopters. 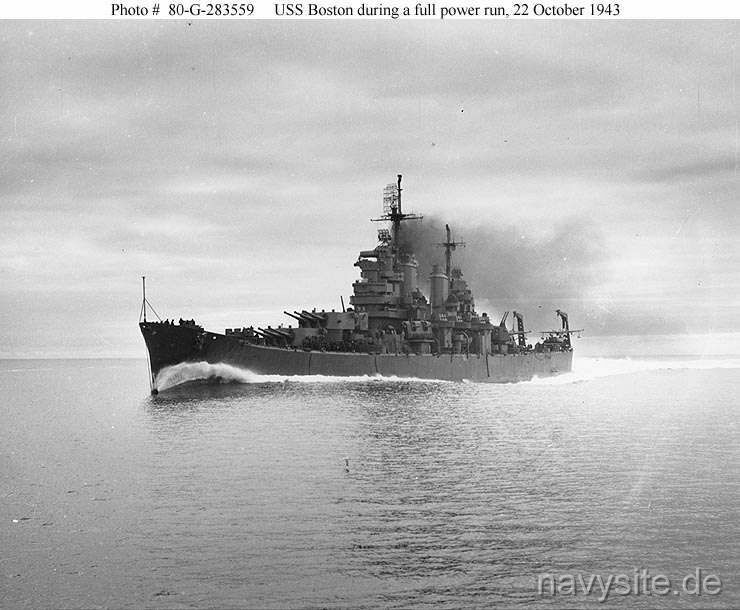 USS BOSTON (CA 69) was launched 26 August 1942 by Bethlehem Steel Co., Fore River, Mass. ; sponsored by Mrs. M. J. Tobin, wife of the Mayor of Boston; and commissioned 30 June 1943, Captain J. H. Carson in command. BOSTON reported to the Pacific Fleet, arriving at Pearl Harbor 6 December 1943. She joined TF 58 in January and took part in the raids on the Marshall Islands in support of the invasions of Kwajalein, Majuro, and Eniwetok (31 January - 28 February 1944); Palaus and Western Carolines (30 March - 1 April); Hollandia and Western New Guinea (21 - 24 April); Truk, including Satawan Island, bombardment (29 April - 1 May); invasion of Saipan (11 - 24 June); 1st Bonins raid (15 - 16 June); Battle of the Philippine Sea (19 - 20 June); 2nd Bonins raid (24 - 26 June); 3rd Bonins raid (3 - 4 July); invasion of Guam (12 July - 15 August); Palau-Yap-Ulithi raid (25 - 27 July); Morotai landings (15 September); seizure of the southern Palaus (6 September - 14 October); and Philippine Islands raids (9 - 24 September). She served with TF 38 during the Okinawa raid (10 October); northern Luzon and Formosa raid (11 - 14 October); Luzon raids (15 and 24 - 26 October, 13 - 14 and 19 - 20 November, and 14 - 16 December); Battle for Leyte Gulf (24 - 26 October); Formosa raids (3 - 4, 9, 15, and 21 January 1945); Luzon raids (6 - 7 January); China coast raids (12 and 16 January); Nansei Shoto raid (22 January); Honshu and Nansei Shoto raids (15 - 16 February and 1 March), in which she bombarded Japan itself. BOSTON then returned to the United States for overhaul, arriving at Long Beach, Calif., 25 March 1945. Returning to the Western Pacific, via Pearl Harbor and Eniwetok, she joined TF 38 for the raids on the Japanese home islands (20 July - 15 August), including the bombardment of Kamaishi, Honshu (9 August). Following the Japanese surrender BOSTON remained in the Far East on occupation duty until 28 February 1946. She then returned to the United States and was placed out of commission in reserve at Puget Sound Naval Shipyard 12 March 1946. 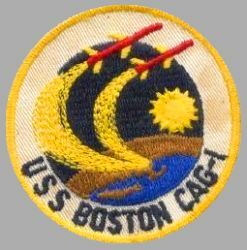 BOSTON was reclassified CAG 1, 4 January 1952. 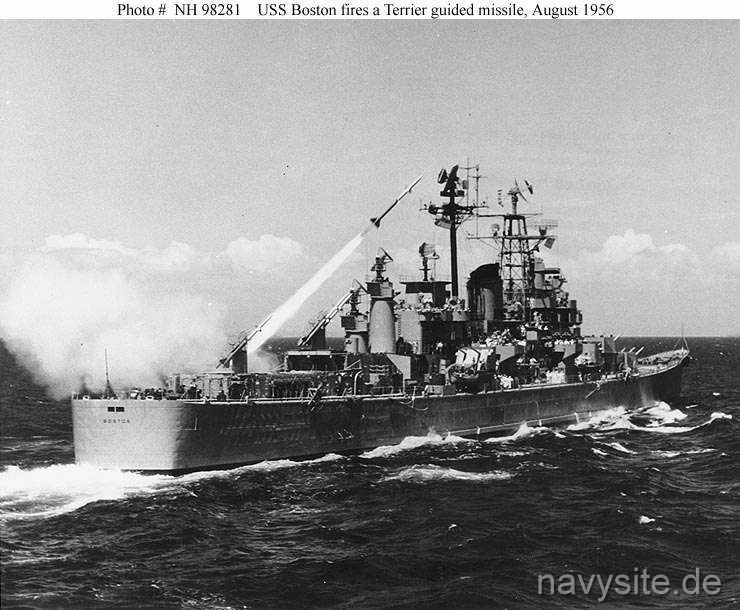 In February 1952 she was towed from Bremerton, Wash., to Philadelphia for conversion to a guided missile heavy cruiser by New York Shipbuilding Corp., Camden, N.J. During conversion her after-8" turret was replaced with anti-aircraft missile launchers and she was otherwise modernized. 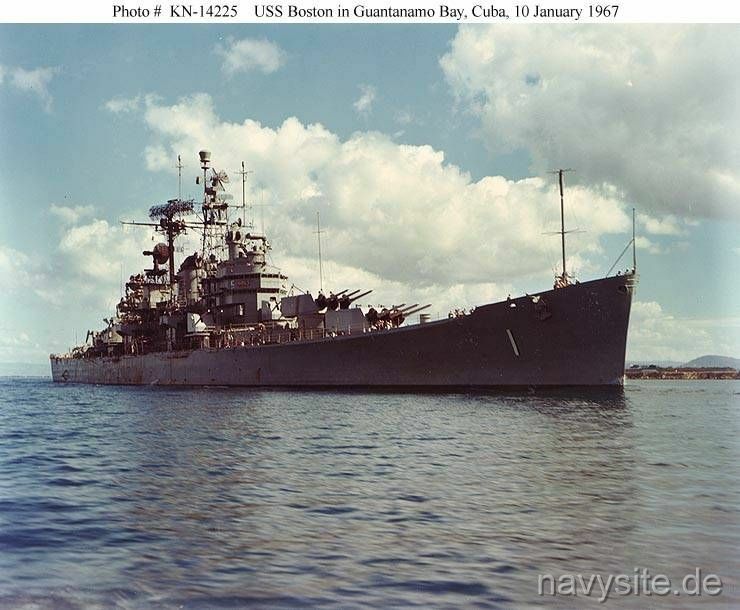 BOSTON was recommissioned 1 November 1955 and operated along the east coast and in the Caribbean conducting missile evaluations and participating in fleet exercises until departing for the Mediterranean 23 November 1956. She returned in May 1957. In June, the BOSTON participated in the fleet review off Jamestown, followed by a midshipmen cruise to Cuba and Chile in July. 3 September - 22 October 1957 found BOSTON taking part in a major North Atlantic Treaty Organisation exercise in the northern Atlantic. 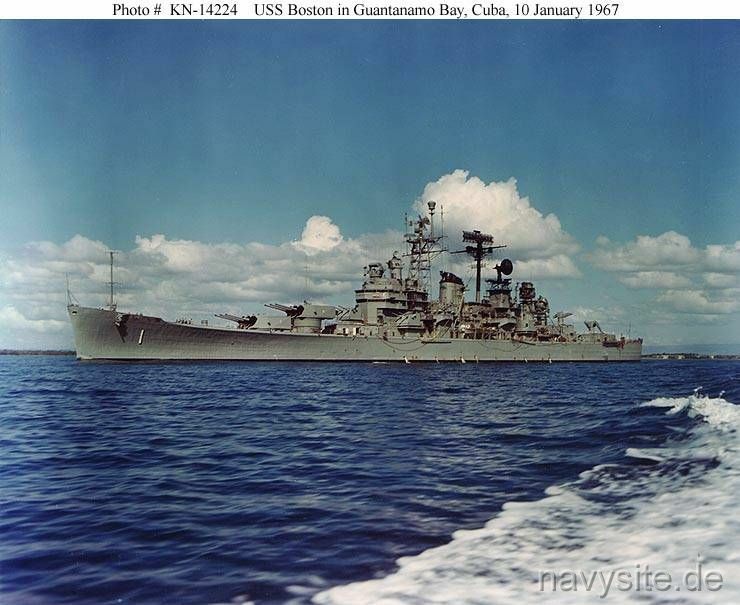 The ship subsequently entered the Norfolk Naval Shipyard 25 November where the BOSTON remained into 1958. 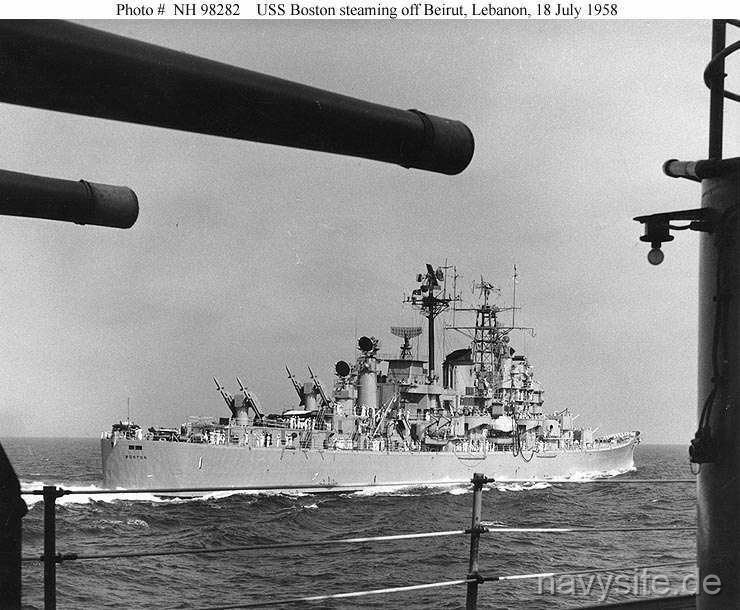 Back in the fleet, BOSTON made another Mediterranean cruise June - September 1958 and afterwards operated along the east coast and in the Caribbean till August 1959, when the BOSTON returned to the Mediterranean for a seven-month deployment. After her arrival back on the east coast, the BOSTON entered the Charleston Naval Shipyard 27 February 1960 and remained there for the next five months. 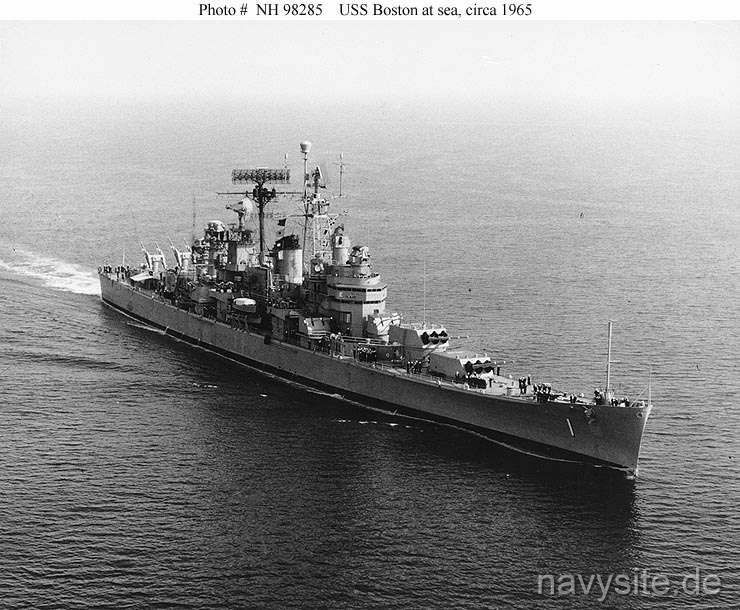 After routine operations along the east coast and in the northern Atlantic, the BOSTON again returned to the 6th Fleet in the Mediterranean for the last two months of 1960 before returning to Boston 21 December. The BOSTON remained on the east coast till September when she entered the Charleston Naval Shipyard. Again heading for the Mediterranean 11 December 1961, BOSTON returned home 5 March 1962 but once again was underway for the Mediterranean 3 August. 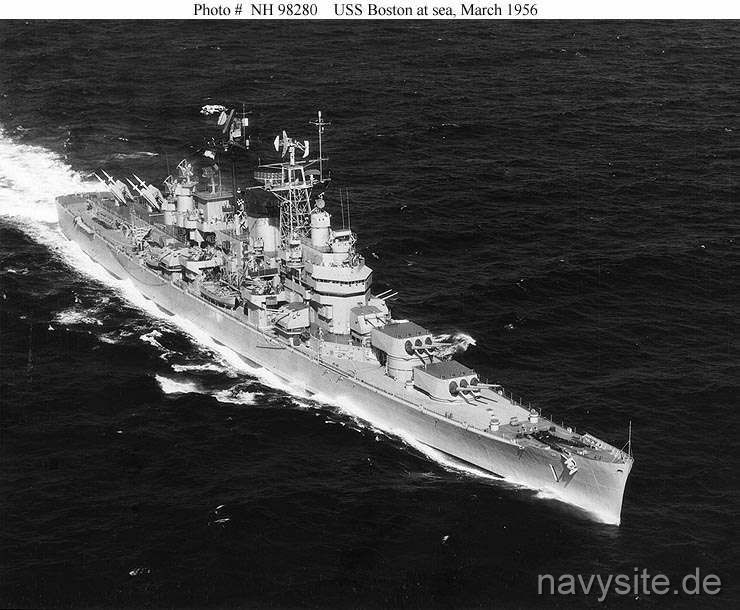 During this deployment, the BOSTON served as flagship for Commander 6th Fleet for six weeks and returned home to Boston 16 February 1963. The ship subsequently entered the Boston Naval Shipyard for a 4-month overhaul which included in the installtion of the SPS-30 Radar system. Ready for duty again in July 1963, the BOSTON resumed her routine schedule, regularly deploying to the Mediterranean for the next 4 years. 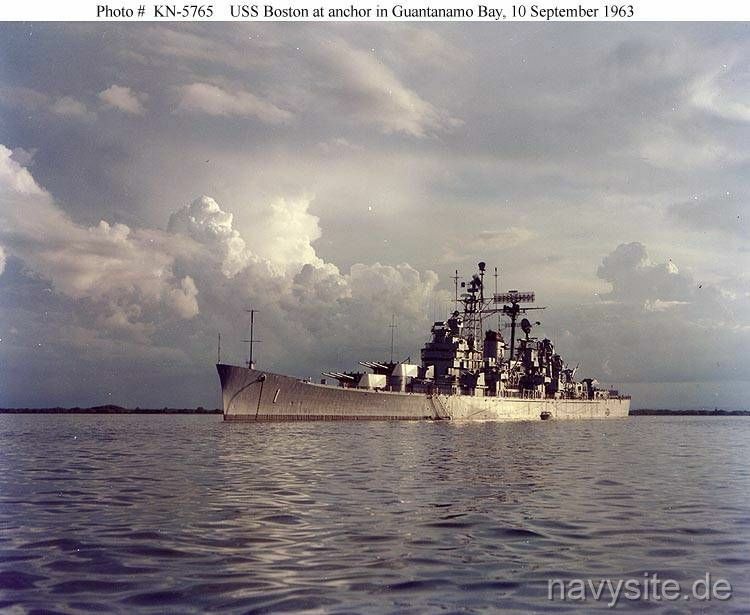 This schedule was only interrupted by a cruise to Vietnam during which the BOSTON provided naval gunfire support. Another Vietnam deployment was conducted in 1968 during which the BOSTON was redesignated CA 69 on 1 May 1968. The redesignation also included the deactivation of BOSTON's guided missile systems. An overhaul was conducted in late 1968, followed by BOSTON's third Vietnam War cruise on which she departed 22 May. On 7 October 1969, BOSTON's 8-inch guns were fired the last time and on 15 November, BOSTON returned home to her homeport of Boston. The ship was decommissioned 5 May 1970.